Myrtle & Eunice: Who’s The Lucky Girl Then? This one! I am the pleased-as-punch recipient of Curly Pops’ shirt apron giveaway and seriously considering a one-off lottery ticket purchase. I figure my luck is in, in, in, which is a refreshing change from having to buy all the school raffle tickets with nary a thing to show for the lost fortunes. The shirt chest pocket converts brilliantly to a handy apron hip pocket and if I ever want to do cartwheels in it, I’ll undo the front buttons. I was so inspired by my new Kitchen Goddess appearance that I baked Beer Bread. I’m afraid I’m not at liberty to part with the recipe as I was a bit cheeky asking a friend for it in the first place. If it’s not a closely guarded family recipe then it should be. Thank you Curly Pops for my apron and thank you lovely L for the oft used and way too more-ish, recipe! Cute apron! Your beer bread looks delicious. Yum! And I love love love the new banner. 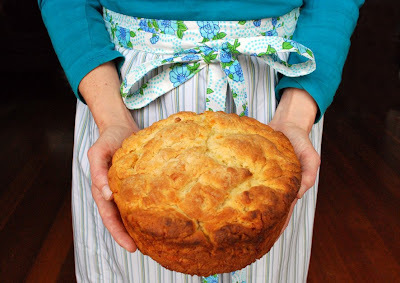 What a gorgeous apron and yummy looking Beer bread! Inspires one to start cooking! You realise all your autumnal stylings have caused my wife to send her boys out on the "get me autumnal colours" mission in the afternoons? It looks fantastic, and so beautifully styled with freshly baked bread! Lucky you! And, the bread looks delish! I wondered if you wanted to do a swap...but since the post before this one I think it's better to wait a little while..;-))). I'm with Cam. It looks like a shot from a magazine. Love the apron and the bread. Nigella her you come. Love that photo!!! Tania, I reckon no tweezers, but the hair was so high on the head we needed a point for our faces to start. man you do good photos and now good bread - should I start addressing you as nigella, kitchen goddess. Congrats on the win - ace apron, my friend. Hope Thursday went well . Beer Bread certainly looks very more-ish ! I just love this photo. It really makes me smile. I used to make beer bread. Hmmmm....... Gonna have to try that again! OH MY GOD - I am the astonished and amazed recipient of one loaf of this AMAZING bread today - she is a GODDESS! I'm thinking of sending it to the CSIRO to get them to try and make out the recipe - GRIN!